Since 2009 Chatham Property Maintenance has been involved in the Savannah pressure cleaning industry. We have worked to put ourselves in the mix as one of the best pressure cleaning companies in Savannah and surrounding areas. The pressure cleaning industry involves such a vast variety of services, it is hard for consumers to understand the difference between pressure cleaning companies. 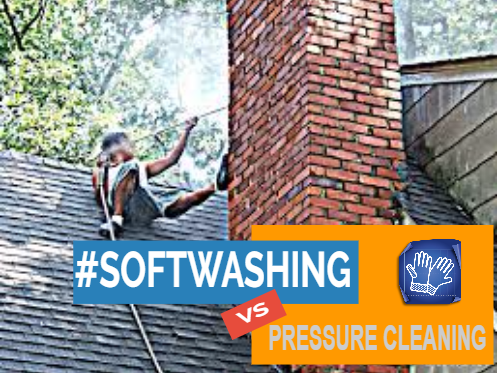 In this article, we will discuss the difference between soft washing vs pressure cleaning. Soft Washing which is a fairly new cleaning concept to the Savannah pressure cleaning industry as an exterior cleaning process. Soft washing was first used in the roof cleaning process. The soft washing process is left open for debate. Many do not understand how to achieve this process of soft washing. Using the word soft washing has become more of a Fad than a different process over the years. With the common use of the word without the knowledge of the soft washing process. Most pressure cleaning companies who commonly use the word have not even taken the time to Google “Soft Washing” to understand it. Just Google “Soft Washing” and then ask, you will be amazed. Soft washing is so simple I believe this is one of the main reasons it is hard for people to understand. Soft Washing is as simple as applying chemical and letting it do the cleaning and rinsing with water under low power/pressure. We use various methods for applying our soft washing chemicals to the surfaces to be cleaned. Soft Washing does not require pressure to clean, the pressure is used as a method of getting the water and chemicals to the surface. Pressure Cleaning is the process of using pressure to clean. It is that simple “Pressure Cleaning”. The wrong person or company performing the task of pressure cleaning can cause damage to your home. We covered this in our article on hiring a professional pressure cleaning company. 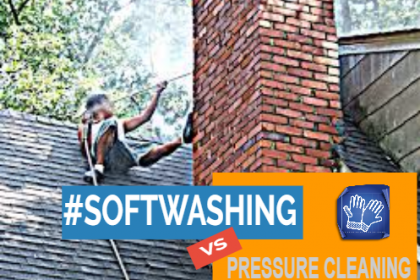 Knowing the difference between soft washing and pressure cleaning! Soft Washing is one of the few cases this applies and this is mainly because it is a fairly new process (If it looks wrong it is probably right). If someone walks around your house appearing to just wet it “They are probably soft washing”. If they are going line by line using pressure to clean they are not soft washing they are “Pressure Cleaning”. Looking for a professional soft washing low-pressure cleaning company in Savannah. Chatham Property Maintenance Savannah’s pressure cleaning services are here to help keep your residential and commercial properties looking their best. Our low-pressure cleaning safely removes all surface pollutants from the exterior of your property. Call or text 912-373-7722 for your free estimate for pressure cleaning services or use our contact form.